A car’s ability to go is only as powerful as its strength to stop. In order to stop a moving vehicle in its tracks, the brake system must be fully reliable – this includes accuracy, responsiveness, and agility. Brakes not only keep us safe, but allow for a smooth transportation experience. Here at Bowe’s Exxon Car Care Center, we keep your car running – and stopping- with the same gracefulness as its first day on the road. 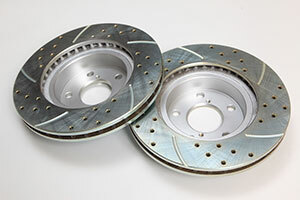 Manufacturers recommend a brake system check annually. It is also important to seek out a Bowes brake technician if the reliability of your brakes is questionable in any sense. The most important factor is safety. As the driver of a vehicle, you are only truly safe knowing that your brakes are in 100% functional condition. Bowe’s Exxon Car Care Center has an experienced team to help you through your next brake inspection or brake repair service. When Bowes gives you the power to stop, you are unstoppable. If you’re near Our location on Butler Pike In Conshohocken take advantage of our free local courtesy shuttle service. Drop your car off take the shuttle to work, home or wherever you need to be in the local area and we’ll pick you up when your car’s brake service has been completed.